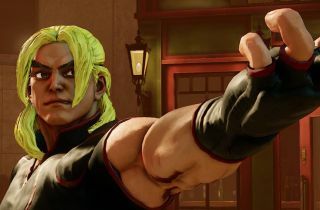 Series regular Ken Masters, (friends can call him Ken), is the latest character to be added to the Street Fighter V roster. A far from surprising addition, sure, but the trailer revealed at San Diego Comic-Con does show the fiery Dragon Punch aficionado rocking a new look. Check out those golden bangs. The video also demos some of Ken's moves, positing him as the fiery, aggressive type—not a huge departure technically, but visually more molten. Our friends at Gamesradar report that “...his Heat Rush V-Tech Ability will bolster his special attacks, among other new moves.” I’m just glad he finally decided to freshen up that old haystack. The video also hints at a future reveal, briefly flashing the face of what is presumably another character on the roster. The PC beta of Street Fighter V is expected sometime this fall.